Love these hangers for kids! The pink color is exactly as pictured. These are very compatible to the Joy Mangano hangers. You can’t beat the price for 60. Honey-Can-Do HNG-01092 10-Pack Velvet Touch Kid's Hanger, Tan/Camel. 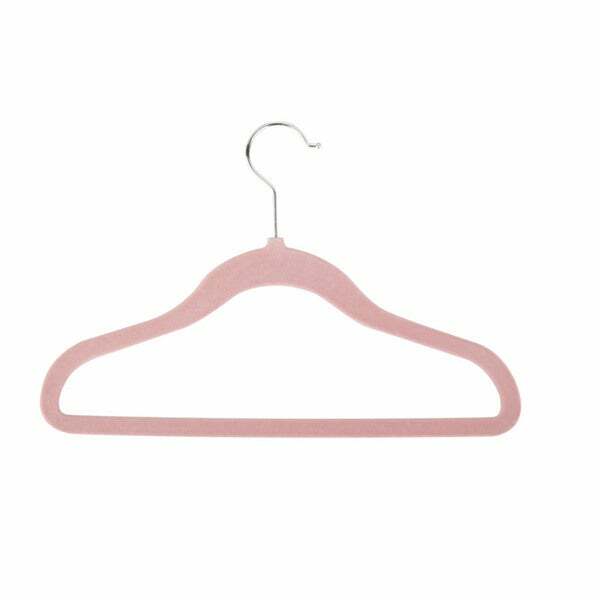 Beautiful, soft, and kid-sized, this clothes hanger is contoured to keep shirts, dresses, jackets, and pants perfectly wrinkle-free. Features a 360 degree chrome, swivel rod hook to hang items easily on any closet rod, towel bar, or standard size door. Durable metal construction provides strength, reliability, and long-lasting beauty. Soft velvet coating is gentle on delicate garments and provides a non-slip surface that holds fabrics beautifully in place. Slim, space-saving design makes the most use of available hanging space with its 1/4" profile. Perfect for my daughter's closet. I love these velvet hangers since clothes do not slip off them and they really maximize space allowing you to hang twice as much. This was also the perfect shade of pink I was looking for. Very durable hangers, not cheap like other sets that I've seen where the hook breaks off with normal use. Great buy! Perfect sized hangers for kids clothes. Good quality and makes the closet look uniform. They accent my daughters white closet perfectly. They keep the clothing on and the slim fit allows more space between items. Love these space saving a cute hangers. My daughter can hang her clothes by herself with these hangers. They aren't to big and chunky for her small hands to handle. Really great purchase. You won't regret. Love these hangers for helping to free up room in my daughter’s closet. My only complaint is that the velvet lining comes off easily if you put pant clips on and try to slide the clips.